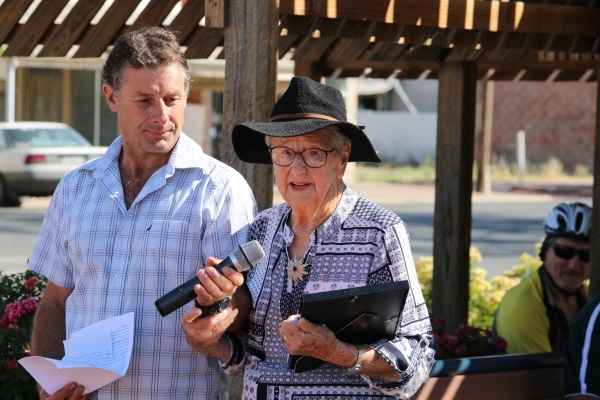 The Jeparit icons were honoured at the Australia Day breakfast on Saturday morning with the 2019 Town Committee awards. 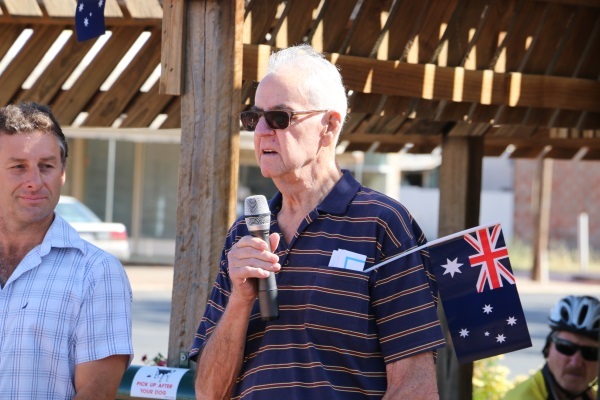 More than 70 local residents enjoyed breakfast at Menzies Square before Town Committee President, Jason Hutson, let the proceedings, introducing Hindmarsh Shire Mayor Ron Ismay and Australia Day Ambassador, Alice Pung. Jason Hutson then presented the annual Town Committee awards to long-time residents Nita Natt and David Livingston and the MOPOKE organisation. Nita Natt is a highly accomplished sporting member and is well known in the Jeparit community. She has been a key member at both the Jeparit Golf and Bowls Clubs. On the golf course, Nita Natt once accomplished a hole in one on the 6th hole of the local course, and has the honour of being the Ladies Club Champion more than 30 times since 1965. Nita’s prowess on the field is also matched by her off field dedication and commitment as Ladies Club President, Secretary and Treasurer spanning over 40 years at the golf club. In more recent years, Nita Natt has been a key active member of the Jeparit Bowls Club. Nita Natt with Jeparit Town Committee President Jason Hutson (left). 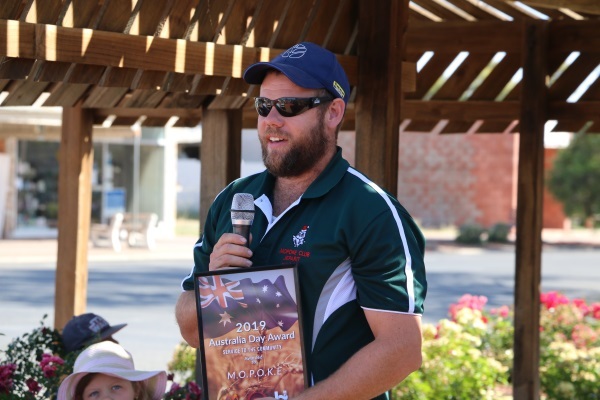 David Livingston is a well-respected member of the Jeparit community and has been part of many local clubs and committees but ranks his involvement in team-orientated events and committees as the most rewarding. At one point, he was involved with no less than 16 local committees. David grew up in the old homestead situated on the original Hindmarsh Station property and when he left school he played tennis, golf, table tennis, was part of the national fitness club, was a member of the Fire Brigade running team that competed across the State, and was a Wimmera champion swimmer. His sporting activity is now a little more sedate but he remains a keen member of the local bowls club. For over 20 years David has been an integral part of Water Watch under the co-ordination of Jeanie Clark from Warracknabeal. He was an original member of the River Environment Committee and was responsible for obtaining grants to plant trees around the river and township of Jeparit. David has been on the Jeparit Cemetery Trust for over 40 years, been on Scout and Guide committees when the children were growing up, manager of the junior football team, a member of the Wimmera Mallee Pioneer Museum Committee, played in the local Jeparit Band, has been on Church Committees, and was a foundation member of the Jeparit Town Committee and local Lions Club. David was also involved in the MOPOKE Club, proudly driving the truck to welcome Santa on his first visit for the MOPOKE Club Christmas Eve festivities. He has continued his involvement with MOPOKE over the years by driving the fire truck to deliver Santa and handing out bags of lollies to the children.  Perhaps not as well known, but none-the-less amazing, was that David Livingston once (engaged by a dare by his mates) swam across Lake Hindmarsh. Departing from Schultz’s Beach, it took almost six hours to reach Picnic Points on the opposite side to the cheers of his makes and onlookers. 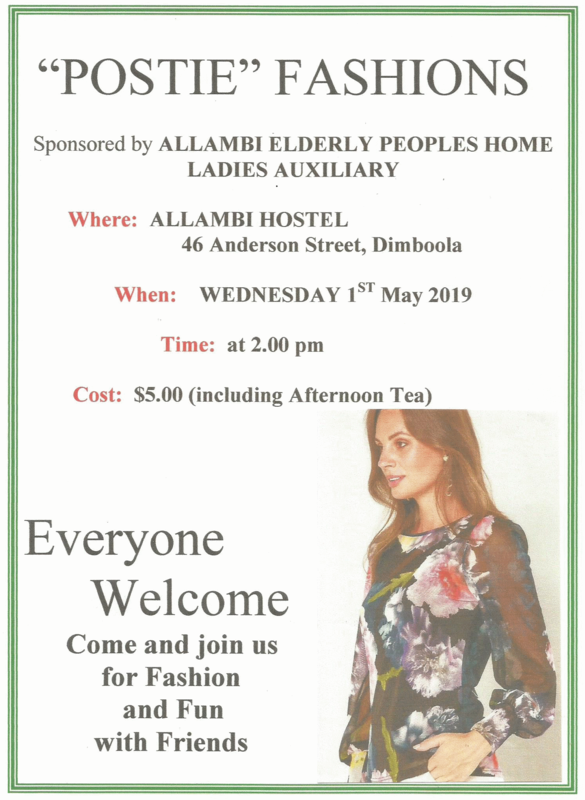 David Livingston’s commitment to the Jeparit township and surrounding community has been outstanding, including 20 years as Captain of the Jeparit Fire Brigade between 1940 and 1994, and then as secretary from 1994 to 1998. Rarely has one person devoted so much time and effort to his community and township. MOPOKE is a volunteer organization dedicated to helping those in our community address their needs during the festive season. MOPOKE was formed in 1949 by a group of men sitting in front of the local pub, who in their wisdom thought it was very important that every child in Jeparit and district receive a present from Santa, and to ensure that Christmas is a special time for family and friends. Though the volunteer’s names have changed over the course of the last 70 years, their ambition has not. Members of MOPOKE have continued to deliver on the vision of the founding members, bringing joy to multiple generations of children in Jeparit. The current President of MOPOKE, Daniel Paech (below), received the award on behalf of the organisation and the generations of volunteers.